One of two traffic circles in the Benton Woods area of North Albany. Just to set the record straight, Albany has five roundabouts and the one under construction now is number six. I was wrong when I wrote, in a photo caption going with a story about the North Albany Road reconstruction project a few days ago, that it would be the fourth. I’m not sure where that “fourth” came from. I think I heard somebody say so at a meeting. 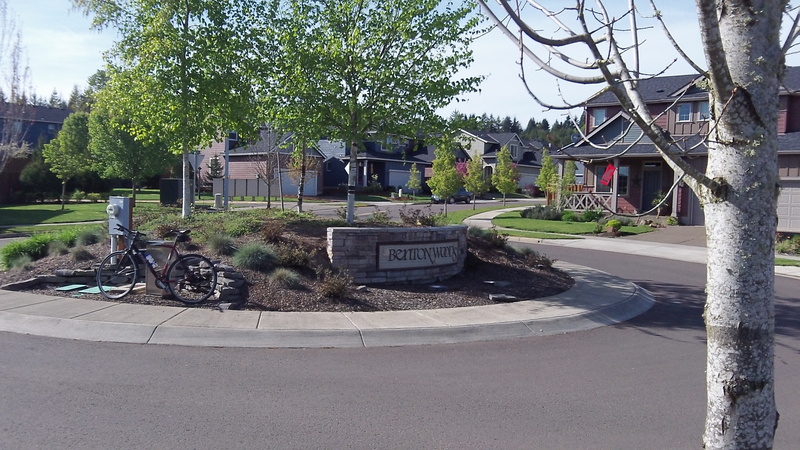 But we forgot the two roundabouts in the Benton Woods subdivision in North Albany. Granted, these two are smaller and carry less traffic than the others. Still, roundabouts they are. This roundabout binge in Albany started about 10 years ago with the first one at North Albany Road and Gibson Hill. (It was completed in 2005 but did not become fully functional until a year or so later.) Then came the one on Knox Butte when Timber Ridge School was built. The two residential roundabouts in Benton Woods came next, and finally, last year, the intersection of Main Street and Salem Avenue got one too. (Are there any others I don’t know about?) And now, No. 6 is being built at Quarry and Spring Hill, apparently without any fuss in terms of objections from the motoring set. Maybe the lack of public debate is the result of experience. Roundabouts are more convenient than stop signs on cross streets, and especially more convenient than four-way stops. They avoid the need to come to a legal stop when nobody is approaching around the circle. On the west side of Corvallis now, Benton County is building a big roundabout at 53rd Street and West Hills Road. The county went so far as to set up a mockup at the fairgrounds so drivers could practice. They could have just suggested that drivers to run over to Albany and practice there. I don’t know yet about how the roundabout at Quarry and Spring Hill will work since it is not constructed. Whether it stays or not will depend on how it is constructed. The curb locations so far don’t look promising. Overwhelming amounts of traffic…probably never a problem here. I’m glad Benton County set up the practice circle at the fairgrounds. There are already enough people “practicing” at the Main/Salem Ave. circle. During my last two passes through, I have had someone within the circle stop to let me in. Apparently, “Yield to cars in the circle” is a difficult concept to grasp. My observations at Main/Salem are quite different than yours, and in comparison to the situation that roundabout solved…well, there is no comparison. I live very near that roundabout and use it daily, at least. Sure there are a few drivers that aren’t sure what to do or when to go…nothing a light tap of the horn won’t cure 95% of the time. You’ve had 2 passes through? Extraordinary bad luck for you, I’d say. I speak from experience far beyond two times through and have seen maybe a half dozen instances where people were truly befuddled. Most handle it just fine and the traffic flow through that part of town is without problems. Before it was a nightmare. When the North Albany roundabout was first proposed, I was a skeptic from the word go. That roundabout has turned out well and I have no problem saying my skepticism was misplaced. The roundabout at Main/Salem has further bolstered my confidence in the roundabout concept in solving some difficult traffic issues. Perhaps those in Benton County are not as “progressive” as they think they are? There have been some horrendous accidents at West Hills/53rd St in Corvallis. Give it a chance. Then, you can be next to admit you were wrong. Anybody been to Bend, Oregon lately. My last count was over 25 modern roundabouts there. As for a roundabout city, it’s hard to beat Carmel (pronounced kar-ml), Indiana. Last count was around 60.